The idea of salmon above Grand Coulee dam is getting a lot of attention these days, both artistic and scientific. Naiads readers are encouraged take two actions: (1) view the movie and (2) comment on the proposal. Details below. Naiads has previously reported on the intrepid Columbia River paddlers who traveled from Astoria, Oregon to Canal Flats, B.C. in the summer and fall of 2014. They have just released a new film that examines the potential for salmon restoration through the lens of their journey. The 35-minute movie, Treaty Talks: Paddling Up the Columbia River for People and Salmon, takes the viewer up the river and into the lives of the Spokane and Colville Tribes kids who carved the dugout canoes, along with many others who dream about and are dedicated to salmon restoration. The Columbia Canoe Journey was undertaken by Voyages of Rediscovery, aka Adam Wicks-Arshack, Xander Demetrios, John Malik, and Jay Callahan. It’s an inspiring and beautiful film. The film was sponsored by Upper Columbia United Tribes or UCUT, a consortium of five tribes in the Upper Columbia basin that serves to protect and restore the natural resources of those tribes – covering 2 million acres and lands and waters located within the states of Washington and Idaho. 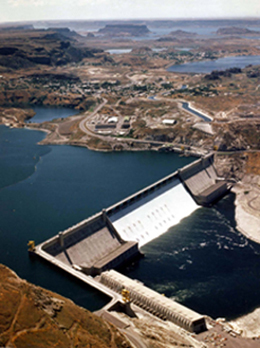 UCUT has been instrumental in promoting a serious policy discussion about salmon reintroduction above Grand Coulee dam. See related posts on this blog discussing the Columbia River Treaty recommendations and other documents. UCUT’s Phase 1 Plan follows on the NW Power & Conservation Council’s October 2014 adoption of the Columbia Basin Fish & Wildlife Program. The program plan calls for a phased approach to study and implement reintroduction of anadromous fish (salmon, steelhead, eels and other species) to areas where fish migrated historically, but which are now blocked due to dams and etc. Categories: Climate Change, Columbia Canoe Journey 2013, Columbia River Treaty, Instream Flows, Salmon | Permalink. September 16 marks the 50th anniversary of the Columbia River Treaty coming into force, and is the first date by which the U.S. or Canada could inform the other nation that it intends to terminate the Treaty in 2024. Many activities have been undertaken to review and consider Treaty updates, none of them contemplating termination. Rather many parties have focused on how to update the Treaty to include modern principles of ecosystem and justice for all affected communities and peoples. In the past year, both countries have undertaken concerted review of the Treaty. In December 2013, the two U.S. agencies in charge of managing the Columbia River dams (BPA and ACOE) issued a cover letter and recommendation for updating the Treaty. Last spring, British Columbia issued its “decision” on the CRT including 14 principles. B.C.’s bottom line is “do not terminate but seek improvements within the existing Treaty framework.” The B.C. view is informed by its June 2013 evaluation of the benefits that the U.S. receives from the Treaty, many of which are not recognized. In December 2013 the B.C. Local Governments Committee issued its recommendations on both international and domestic issues associated with the Treaty. The Columbia Basin Tribes Coalition has provided great leadership in moving Treaty modernization toward a new model of ecosystem restoration and shared governance, starting with 2010 issuance of the Common Views document. The Tribes are pushing the Corps of Engineers to re-evaluate flood risk management of the Columbia River, and seek consultation as sovereigns with the U.S. Department of State, reportedly the only U.S. agency that lacks a formal policy to implement its trust relationship with U.S. Tribes. In February 2014, all of the Tribes and First Nations jointly issued a policy paper and sponsored two conferences to discuss how to bring salmon and other migratory fish species back to the Upper Columbia River, which would benefit watersheds and people in both countries. Sierra Club and CELP are jointly pursuing the Ethics & Treaty Project working with religious and indigenous leaders and communities. The goal is to ensure that changes to the Treaty have a foundation in stewardship and justice. The Declaration on Ethics and Modernizing the Treaty is circulating for signature by all interested parties. With the 50th anniversary at hand, and in the face of climate change impacts on water, it is time for the governments of Canada and the United States to work with the people of the Columbia River Basin to usher in a new era of principled river management. Categories: Columbia River Treaty, Salmon | Permalink. When Will Salmon Return to the Spokane? Water flows are critical to salmon’s ability to get up the river, around the dams, and home to natal spawning grounds. For Okanogan sockeye, the water spills at Columbia River dams ordered by Judge Redden, as part of the epic Columbia hydropower system Endangered Species Act lawsuits, are proving their merit this year with sockeye’s return. And just as critical, the Native Nations of the Okanogan Nation Alliance have been the leaders in calling the salmon home — through hard work, collaboration, negotiation, and faith. When will salmon — in this case Chinook and steelhead — return to the Spokane River? 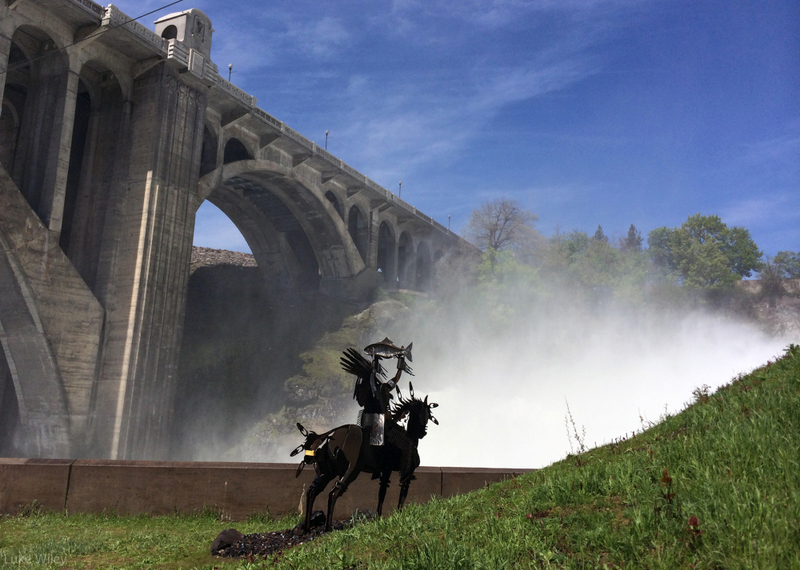 The “calling home” has begun, with official discussions of fish passage at Grand Coulee and Chief Joseph dams, with the Spokane City Council’s endorsement of the NW Power Council’s proposal for return of salmon to the Upper Columbia, and even with the Salmon Chief sculpture installed at the base of the Spokane Falls in May. And maybe, just maybe, the Washington Department of Ecology will come to understand its role to ensure enough water in a critical spawning and rearing area for our future salmon, when it adopts an instream flow for the Spokane River later this year. So far, Ecology has not seen its place in this calling of the salmon home. Salmon will return to the Spokane. People with vision, please visit here. 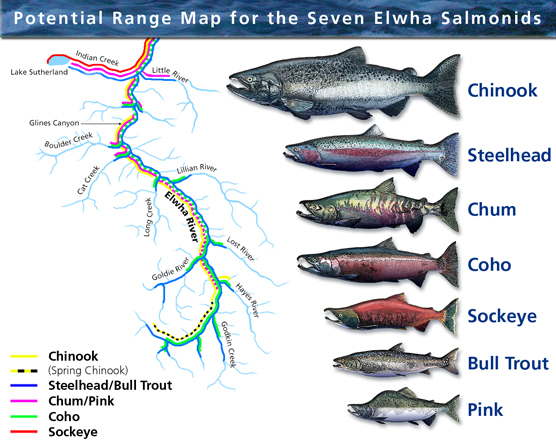 Categories: Columbia River Treaty, Instream Flows, Salmon, Spokane River | Permalink. Categories: Climate Change, Columbia River Treaty, Instream Flows, Western Water Law | Permalink. A new analysis issued by Columbia Basin Tribes and First Nations surveys historic salmon migration to the Upper Columbia and proposes a four-step process to study reintroducing salmon via fish passage at Grand Coulee and Chief Joseph dams in the U.S., and Keenleyside, Brilliant and Waneta dams in British Columbia. 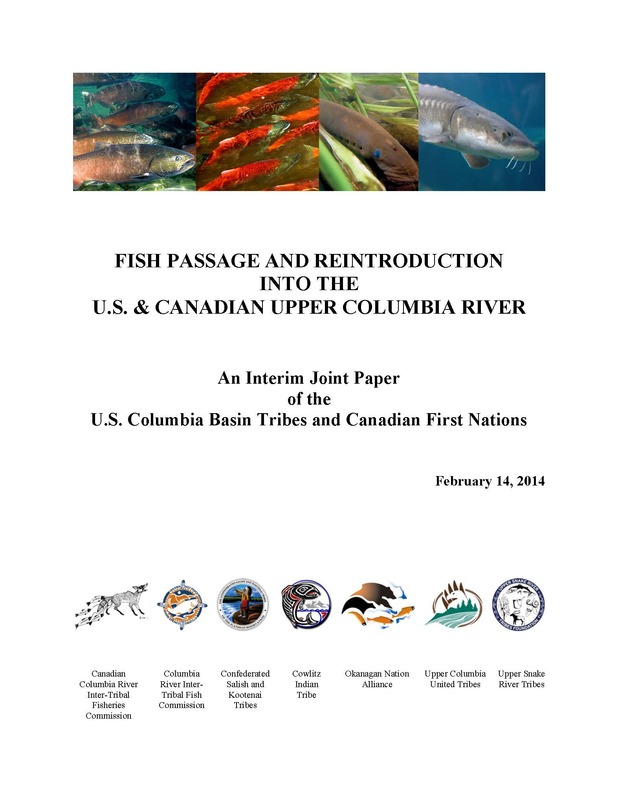 The study, “Fish Passage and Reintroduction Into the U.S. and Canadian Upper Columbia River” is authored by several intertribal organizations representing 15 Native American Tribes in the U.S. Columbia basin, and several First Nations in British Columbia. The study provides a brief history of the construction and management of Columbia River dams and the consequent devastating impact on salmon populations and the native peoples who depended on salmon for food, trade, and culture. Prior to dam construction, 1.1 million sockeye, Chinook, steelhead and coho salmon returned to the rivers above Grand Coulee, of which about 644,000 fish were harvested by tribal members. Total salmon consumption ranged from 6.8 to 13.1 million pounds per year. Salmon was a key component of the diet of Upper Columbia Tribes and First Nations prior to extirpation. The survey of rivers and lakes that once supported salmon species is impressive. In the U.S. that list includes the Spokane, Little Spokane, Hangman, Sanpoil, Kettle, Colville, Pend Oreille, and Kootenai Rivers. In British Columbia, salmon inhabited the Kootenay, Slocan, and Salmo Rivers, and the Columbia River lakes all the way to the headwaters, including the Lower and Upper Arrow, Windermere and Columbia Lakes, and others. The Tribes propose a multi-step process to evaluate fish passage technology, donor fish stocks, the quantity and quality of habitat, and hydrosystem operating changes that would be necessary to accommodate salmon reintroduction. Studies would also evaluate the socio-economic benefits of returning salmon to the Upper Columbia basin, for Tribes and First Nations, and non-native peoples, including recreational, subsistence and commercial fishers. The study was prepared as part of the preparation for negotiations over the Columbia River Treaty between the United States and Canada, expected to get underway this year. Categories: Climate Change, Columbia River Treaty, Salmon, Spokane River | Permalink. From the Sunday paper in Spokane . . . These falls are that place where ghosts of salmon jump, where ghosts of women mourn their children who will never find their way back home. From “The Place where the Ghosts of Salmon Jump,” by Sherman Alexie (inscribed at the Spokane Falls overlook). Canada and the United States are preparing to renegotiate the Columbia River Treaty. The treaty, first signed in 1961, governs management of the Columbia, once the richest salmon river on Earth, but now converted by dams into the world’s largest integrated hydropower system. Reconsideration of the treaty will profoundly impact the future economies, environment and quality of life of people on both sides of the border. That’s why last August, thousands of Pacific Northwest citizens wrote to urge the federal government to include ecosystem restoration as a core component of a renegotiated treaty. They also called for opening the Upper Columbia Basin to the salmon that once thrived above Grand Coulee Dam, including in the Spokane River. The current U.S. position recommends the U.S. State Department make managing the health and environment of the Columbia watershed a central purpose of a modernized treaty – as important as power generation and flood control. This is a wise and farsighted recommendation that will not only enhance the lives and economies of future generations in the Columbia basin, but also provide some recompense to the Columbia River tribes whose economies, culture and spirituality remains intertwined with salmon despite terrible damage wrought by dams. Managing the Columbia for its environmental health must mean more than current efforts to comply with the Endangered Species Act. Current recovery efforts fail to meet the life-cycle needs of the Northwest’s most iconic species. Most wild populations are maintaining or declining, despite coming under the protection of the act between 14 and 22 years ago. Present management of Columbia dams remains unsustainable for salmon and other native species. Climate change is also aggravating existing river-management challenges. This summer, temperatures from McNary Dam to Bonneville Dam on the Columbia were 70 degrees or above for 41 straight days, and for 56 straight days in the middle and longest part of that reach. This previews coming years, when this year’s highest temperature, 73.2 degrees at John Day Dam on Sept. 11, will be a new norm that portends an unhealthy river pushing salmon to extinction. Washington will suffer impacts of climate change more acutely than British Columbia. In the decades ahead, as much as 60 percent of summer flows in the Columbia will come from our neighbor to the north. We must renegotiate the treaty to include ecosystem restoration so that our two nations have a framework to respond effectively to climate changes already unfolding in the basin. Northwest utilities currently oppose adding “ecosystem” and “environment” to the treaty, even seeking to terminate the treaty if they don’t get their way. We believe this position overlooks that, for today’s Northwest, ecosystem function is economic function. Both Northwest power production and flood risk management will improve with ecosystem function as the treaty’s third purpose. So will other river-based economic sectors, including salmon. All economic activities in the Columbia River Basin will be damaged by the hotter, unhealthier waters that climate change is creating. All will benefit by urgent, creative bilateral responses. Indeed, a much-needed creative response that would benefit both the U.S. and Canada is to jointly plan how to open up miles of habitat now closed to salmon in British Columbia and the U.S., including the Spokane River. We do not have to settle for ghost fish. Restoring the ecosystem of the Columbia holds the promise of healthy salmon returning to the headwaters and someday jumping once again at Spokane Falls. Decisions made now will have an enormous impact on our region’s economy, environment, and quality of life for the next 50 years. Help restore the Columbia to health. Help bring the salmon home. Help make restoring the Columbia’s ecosystem a core purpose of a modernized Columbia River Treaty. Categories: Climate Change, Columbia River Treaty | Permalink.